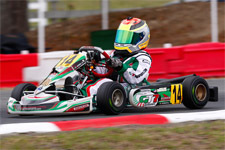 Always a driver to beat, GT7 Motorsports pilot Dylan Tavella was back behind the wheel of his Charlie Swayne prepared Tony Kart as the duo would once again look to fight for the win. 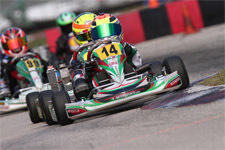 Arriving at the facility midweek to complete unofficial practice on Thursday and Friday, official competition would take place over the weekend as two separate race days would see competitors on track for a warm-up, qualifying, prefinal and main event. Starting off his weekend strong, Tavella broke to the front of the Rotax Mini Max field by taking the pole position in the morning qualifying session. Able to start the prefinal in the inside of the front row, the multi-time champion would look to hold steady and maintain his starting position for the day’s main event. 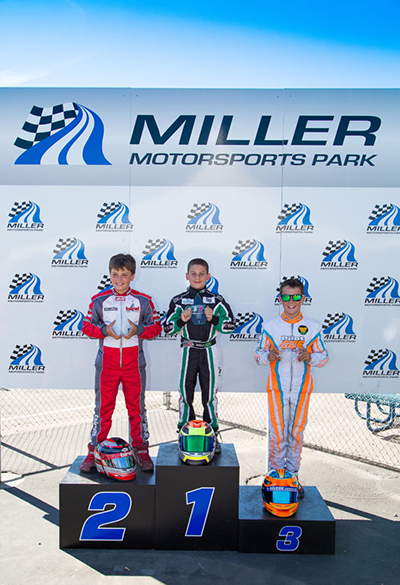 Battling at the front of a talent-laden field, Tavella would be shoved wide in one of the Miller Motorsports Park tricky corners, as a host of drivers would sneak past. 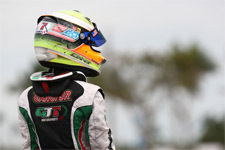 Ending the prefinal in P8, Tavella would start the main event from outside row four. With a never say die attitude, Tavella quickly moved towards the front of the field in the 14-lap main event. Slicing and dicing his way into the top-five, the New York driver managed to reach the third position before the checkered flag would fly. Celebrating on the podium that evening, Tavella and his GT7 Motorsports squad were determined to better themselves on Sunday. Back to the track Sunday morning and under very similar conditions, Tavella repeated Saturday’s qualifying performance and once again stole the pole position. In the prefinal, Tavella would fall back slightly but not like on Saturday. 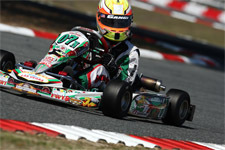 Maintaining his position in the top-five, the Tony Kart driver would battle hard and secure a fourth place finish putting him in a good position to challenge for the day’s race win. Taking charge at the drop of the green flag, Tavella wasted no time slotting into position. Understanding the depth of the field and the chess game that is Mini Max competition, the young gun positioned him in the top-three as the race wore on. Slowly stalking the leaders, Tavella would make his move just past the half way mark and never look back. 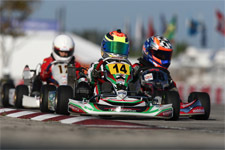 As the competition grew fierce behind him, the Challenge of the America’s Mini Max titleholder turned fast lap after fast lap to stretch his margin. Taking the top spot and claiming the checkers, Tavella secured himself as one of the favorites heading into mid July’s Grand National championship event. 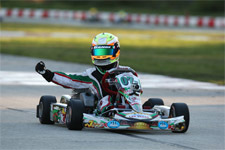 Dylan Tavella would like to thank his tuner and motor builder Charlie Swayne, GT7 Motorsports, K1 RaceGear, Oakland Valley Race Park (OVRP), Chase Racing as well as everyone at the MAXSpeed Group and the Miller Motorsports Park for their hard work and dedication towards the Rotax Summer Shootout and the Cold Stone US Grand Nationals.